Created by our own founder, Keith Cornell, CP FAAOP, the CJ Socket is the innovative approach to prosthetics. This novel shift from conventional, rigid sockets allows patients to adjust the fit to match their bodies. 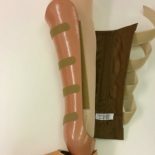 Half of the residual limb is covered with the J-shaped socket, and this flexible prosthetic socket provides support only where it’s needed. Reducing half the weight and half the heat means you’re left with little to no hassle. 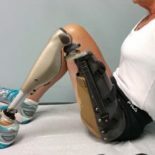 The Sail holds the rest of the residual limb and allows the patient to comfortably sit, stand, or do whatever it is they need. 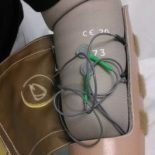 Finally, the closure can be adjusted by the user, allowing them to change the fit of their prosthetic depending on residual limb volume changes. Reach out to our team today learn more about the CJ Socket and to get started. Experience comfort and mobility with upper-extremity CJ Sockets. We customize the fit to your specifications, then allow you to adjust the rest. A custom fit with your needs in mind, we combine science, art, and compassion to find the CJ Socket for you. Reclaim your mobility and reach out now. Find a fit that makes sense. With CJ Socket, you can experience the ultimate in comfort and mobility, with a fraction of the hassle. ©2018 Cornell Orthotics and Prosthetics - Do not copy mockup. All rights reserved.